Any uncatalogued X-ray sources detected in this analysis will be reported on this website and via GCN COUNTERPART notices. These are not necessarily related to the Fermi/LAT event. Any X-ray source considered to be a probable afterglow candidate will be reported via a GCN Circular after manual consideration. At 05:00:34.23 UT on June, 23, 2016 Fermi-GBM triggered on GRB 160623A (trigger 488350837 / 160623209). This burst is also visible in the Swift/BAT raw count rate light curve, during a slew with no event capture (D. Palmer/Swift private communication). As the source came into the field of view of Fermi-LAT 400 s later, high-energy emission was detected at a position compatible with GRB 160623A. with an error radius of 0.1 deg (90 % containment, statistical error only). The source is very bright in the LAT, with a fading high-energy emission detected up to approximately 12 ks after the trigger time. We detect more than 15 photons above 1 GeV. We note that the LAT position is close to the Galactic plane, corresponding to (L,B) = (84.17, -2.69) deg. Given the large uncertainty in the GBM localization, we cannot exclude at this stage the possibility that the LAT transient is a Galactic transient unrelated to the GBM GRB. However, as seen by the LAT, the transient has spectral and temporal properties typical of a long GRB. A Swift ToO has been requested for this burst. The very bright, long-duration GRB 160623A (Fermi-LAT detection: Vianello et al., GCN 19553) triggered Konus-Wind at T0=17977.594 s UT (04:59:37.594). The light curve shows a broad pulse in the interval from ~T0-25 s to ~T0+30 s, followed by a weaker emission lasting until ~T0+200 s. The emission is seen up to ~15 MeV. As observed by Konus-Wind, the burst had a fluence of 6.6(-0.1,+0.1)x10^-4 erg/cm2, and a 64-ms peak flux, measured from T0+9.920 s, of 1.27(-0.03,+0.03)x10^-4 erg/cm2/s (both in the 20 keV - 10 MeV energy range). The time-averaged spectrum (measured from T0 to T0+38.912 s) is best fit in the 50 keV - 15 MeV range by the GRB (Band) function with the following model parameters: the low-energy photon index alpha = -1.05 (-0.03,+0.03), the high energy photon index beta = -2.67 (-0.10,+0.08), the peak energy Ep = 562 (-23,+23) keV, chi2 = 107/88 dof. The spectrum near the peak count rate (measured from T0+7.936 to T0+11.776 s) is best fit in the 50 keV - 15 MeV range by the GRB (Band) function with the following model parameters: the low-energy photon index alpha = -0.88 (-0.05,+0.05), the high energy photon index beta = -2.95 (-0.14,+0.11), the peak energy Ep = 648 (-32,+33) keV, chi2 = 104/88 dof. "At 05:00:34.23 UT on 23 June 2016, the Fermi Gamma-Ray Burst Monitor triggered and located GRB 160623A (trigger 488350838 / 160623209 ), which was also detected by the LAT (G. Vianello et al. 2016, GCN 19553) and Konus-Wind (D. Frederiks et al. 2016, GCN 19554). The GBM on-ground location is consistent with the LAT position. The angle from the Fermi LAT boresight at the GBM trigger time is 83 degrees. The GRB was occulted by the Earth for a large part of its duration, and the GBM trigger occurred ~50 s after the start of the GRB based on the Konus-Wind lightcurve. The GBM light curve consists of a single peak with a duration of about 50 s. The time-averaged spectrum from T0-4.9 s to T0+32.8 s is best fit by a power law function. The power law index is -1.60 +/- 0.04. The event fluence (10-1000 keV) in this time interval is (5.598 +/- 0.369)E-06 erg/cm^2. Swift-XRT has performed follow-up observations of the Fermi/LAT-detected burst GRB 160623A (Vianello et al. GCN Circ. 19553), collecting 1.9 ks of Photon Counting (PC) mode data between T0+40.3 ks and T0+45.4 ks. with an uncertainty of 3.5 arcsec (radius, 90% confidence). This position is 2.5 arcmin from the Fermi/LAT position. The light curve can be modelled with a power-law decay with a decay index of alpha=2.3 (+0.5, -1.4). A spectrum formed from the PC mode data can be fitted with an absorbed power-law with a photon spectral index of 1.79 (+0.21, -0.20). The best-fitting absorption column is 1.69 (+0.32, -0.29) x 10^22 cm^-2, in excess of the Galactic value of 7.2 x 10^21 cm^-2 (Willingale et al. 2013). The counts to observed (unabsorbed) 0.3-10 keV flux conversion factor deduced from this spectrum is 6.3 x 10^-11 (1.1 x 10^-10) erg cm^-2 count^-1. If the light curve continues to decay with a power-law decay index of 2.3, the count rate at T+24 hours will be 0.12 count s^-1, corresponding to an observed (unabsorbed) 0.3-10 keV flux of 7.6 x 10^-12 (1.4 x 10^-11) erg cm^-2 s^-1. The results of the XRT-team automatic analysis of the likely afterglow are at http://www.swift.ac.uk/ToO_GRBs/00020666/index_1.php. The results of the full analysis of the XRT observations are available at http://www.swift.ac.uk/ToO_GRBs/00020666. GRB 160623A was detected by Fermi/LAT on 2016 June 23 (Vianello et al. GCN Circ. 19553) and its X-ray afterglow was identified by Swift/XRT (Maselli et al. GCN Circ. 19558). The XRT observation started on 2016 June 23 at 16:11:43 UT (40.3 ks after the Fermi trigger) and lasted until 17:37:24, collecting data in PC mode for a net exposure time of approximately 1.9 ks. This burst was exceptionally bright and located at low Galactic latitude (b=-2.6). The total Galactic extinction towards the GRB is Av = 4.1 according to Schlafly & Finkbeiner 2011, ApJ 737, 103, or 4.8 according to Schlegel et al. 1998, ApJ 500, 525. A bright X-ray halo with radius of approximately 3.5 arcmin is clearly visible around the GRB. This halo is possibly composed by multiple rings produced by dust clouds in our Galaxy that scatter the GRB X-ray emission. The observation is too short to detect confidently the expansion of the halo. From the size of the halo and the time of the GRB, we derive a distance of about 800 pc for the closest dust structure responsible for the scattering. Despite a hint of some decaying of the source it is unclear whether source is an afterglow of GRB 160623A. We observed the field of GRB 160623A (Vianello, et al., GCN 19553) with the Reionization and Transients Infrared Camera (RATIR; www.ratir.org) on the 1.5m Harold Johnson Telescope at the Observatorio Astron=F3mico Nacional on Sierra San Pedro M=E1rtir from 2016/06 24.44 to 2016/06 24.47 UTC (29.48 to 30.31 hours after the BAT trigger), obtaining a total of 0.56 hours exposure in the r and i bands and 0.23 hours exposure in the Z, Y, J, and H bands. These magnitudes are in the AB system and are not corrected for Galactic extinction in the direction of the GRB. Comparing our images to the finder chart reported by Pozanenko, et al. (GCN 19561), we believe this to be the same optical source. It has apparently faded by about 1 mag in r over the ~16 hours separating our observations. The source is located at RA, Dec =3D 21:1:11.48, +42:13:14.6 (J2000, +/-0.5"). Further observations are planned. The magnitudes in the table are not corrected for the Galactic extinction due to the reddening of E(B-V) = 1.35 in the direction of the burst (Schlegel et al. 1998). We observed the field of GRB 160623A (Vianello et al., GCNC 19553; Tiengo et al., GCNC 19559) with the optical three color (g', Rc and Ic) CCD camera attached to the Murikabushi 1m telescope of Ishigakijima Astronomical Observatory. The observation started on 2016-06-23 15:14:25 UT (~10.2 h after the burst). We detected the previously reported afterglow (Pozanenko et al., GCNC 19561; Butler et al., GCNC 19567) in Rc and Ic bands. Three sigma upper limit and photometric results of the OT are listed below. We used GSC2.3 catalog for flux calibration. We observed the GRB 160623A afterglow (Mingo et al. GCN 19558, Butler et al. 19567) with Submillimeter Array (SMA) on 2016/06/24 (1.1 day after the Fermi-GBM trigger) and 2016/06/25 (2.2 day). The quick look image at the 1st epoch shows the bright (~15 mJy) submm afterglow. The source also shows a gradual fading at the 2nd epoch (corresponding decay index of ~-0.4). We thank the staff of SMA. The long-duration GRB 160623A (Mailyan et al., GCN Circ. 19555; Vianello et al. GCN Circ. 19553; Mingo et al. GCN Circ. 19558; Frederiks et al. GCN Circ. 19554) triggered the CALET Gamma-ray Burst Monitor (CGBM) at 04:59:34.27 on 23 June 2016. The burst signal was seen by all CGBM instruments. The CGBM data used in this analysis are provided by the Waseda CALET Operation Center located at the Waseda University. We observed the Fermi/LAT GRB 160623A (Vianello et al., GCN 19553) with the AMI Large Array at 15 GHz on 2016 Jun 25.15 and Jun 27.15 (UT), 2.0 and 4.0 days post-burst, as part of the 4pisky program. We detect an uncataloged variable radio source at the XRT location (Mingo et al., GCN 19558) at 5.0+/-0.1 mJy and 6.3+/-0.1 mJy (preliminary) respectively. Monitoring of this source is underway. We thank the AMI staff for scheduling these observations. The AMI-GRB database is a log of all GRB follow up observations with the AMI, and is available at http://4pisky.org/ami-grb/. A. Moskvitin (SAO RAS, Russia) report on behalf of the larger team. 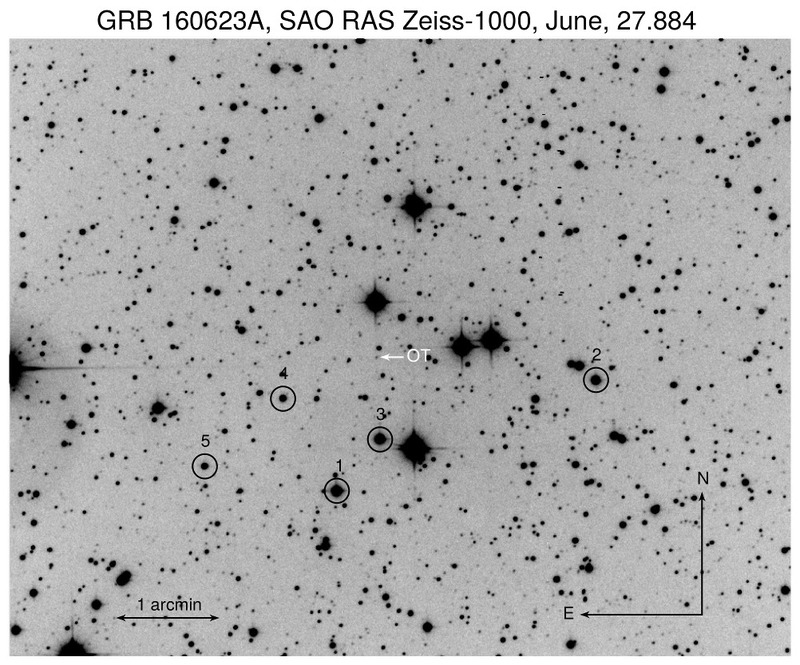 We observed the field of GRB160623A (Vianello et al., GCNC #19553; Mailyan et al., GCNC #19555) with the 1-meter telescope Zeiss-1000 of SAO RAS on June, 27.884 (4.676 days after the trigger). A set of 8 x 300 sec. frames in Rc band were obtained. The source was clearly detected in the 40-200 keV energy range. The light curve shows a single peak at UT 04:59:45.0, 49.23 seconds before the fermi trigger At 05:00:34.23 (trigger 488350837 / 160623209). The peak count rate was 2940 counts/sec above the background (four quadrants summed together), with a total of 20385 counts. The local mean background count rate of 193.2 is counts/sec. 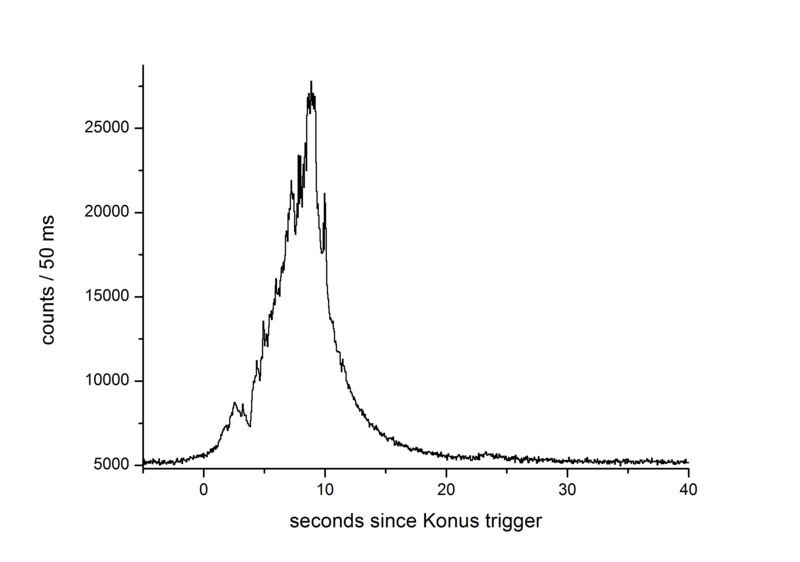 Using cumulative rates, we measure a T90 of 14.2 sec. CZTI GRB detections are reported regularly on the payload site at http://astrosat.iucaa.in/czti/?q=node/9 . CZTI is built by a TIFR-led consortium of institutes across India, including VSSC, ISAC, IUCAA, SAC and PRL. The Indian Space Research Organisation funded, managed and facilitated the project. We observed the field of GRB 160623A (Vianello et al., GCN 19553; Frederiks et al., GCN 19554; Mailyan et al., GCN 19555) with the Nordic Optical Telescope (NOT) equipped with the AlFOSC imager. Our observations had a mid time 2016 July 8.09 UT (14.88 days after the GRB trigger) and consisted of 6x300 s in the SDSS i filter. We measure I = 20.6 +- 0.2 (Vega) against several nearby USNO stars (error dominated by the calibration). To determine the relation of this object with the GRB afterglow, we cross-registered our image with those from RATIR (Butler et al., GCN 19567), yielding an RMS of 0.02". We find that the NOT source is offset to the SE of the afterglow by 0.7". This source could thus be the host galaxy or an unrelated, foreground star. We also note some faint emission in the RATIR image at the NOT coordinates, despite being blended with the brighter afterglow. A spectrum (3x1200 s exposure) was acquired using the Gran Telescopio Canarias (GTC) equipped with OSIRIS, covering the wavelength range 5100-10,000 AA (grism R1000R), starting on 2016 July 10.163 UT (16.95 days after the GRB). The slit was centered at the coordinates of the NOT object, but also partially overlapped with the afterglow location. We detect continuum over the whole wavelength range and two emission lines in the red part of the spectrum, which we interpret as Halpha and [N II] at a common redshift z = 0.367. At the same redshift we also detect weak [O III] 5008 (dimmed by the large foreground extinction). This is most likely the redshift of GRB 160623A. The source detected in the NOT image is possibly a foreground star (the Galactic latitude is b = -2.7 deg). In the GTC acquisition image, the object is pointlike with a seeing of 1.2". On the other hand, inspecting the 2D spectrum, the spatial profile of the emission lines is different from that of the continuum: the features are wider and elongated towards the position of the afterglow. A compact host cannot however be excluded. At z = 0.367, a SN as bright as SN 1998bw would only reach a peak magnitude of I ~ 24.8 (Vega) given the large Galactic extinction (A_I = 2.2 mag; Schlafly & Finkbeiner 2011). From ground, such a SN would be difficult to distinguish against the brighter foreground object. We acknowledge excellent support from the observers at the NOT (in particular Roi Alonso and Diego Hidalgo) and at the GTC. Following the detection of GRB 160623A by Fermi (Vianello et al. GCNC 19553) and Konus-Wind (Frederiks et al. GCNC 19554), we observed the optical afterglow of GRB 160623A (Pozanenko et al. GCNC 19561) with the 10.4m Gran Telescopio Canarias (GTC), gathering spectra at different epochs: June 25 (1.9 days post-burst) and July 3/4, with both the R1000B and R2500I grisms covering the range 3800-10000 A. At the position of the afterglow, the reddest spectrum (2 x 1200s with R2500I) showed H-alpha and [SII] in emission, from which we determine a redshift z = 0.367, confirming the value proposed by Malesani et al. (GCNC 19708). The bluest range spectrum (1200s) also revealed a marginal detection of H-beta (taking into account the high foreground Galactic extinction in the line of sight). The faint continuum on the first epoch spectrum extended down to 3800 A with no absorption lines being present. Therefore we propose this is the redshift of the GRB 160623A host galaxy. We acknowledge excellent support from the GTC staff. We carried out Giant Metrewave Radio Telescope (GMRT) observations of GRB 160623A (Vianello et al. GCN Circ. 19553) at 1460 MHz band on 2016 Aug 04.91 UT. We detect a 4.5-sigma source at the GRB position (Vianello et al. GCN Circ. 19553) with a flux density of 207+/-78 uJy. This is most likely the radio afterglow of GRB 160623A. Map rms is 50 uJy. We thank GMRT staff for making these observations possible.